In the beginning there was Fix. Later there was Alfa. Then came Amstel, Heneiken and Henninger and eventually Mythos. But by then there was no more Alfa and Fix. So for years there were really only three or four choices, all lagers or pils and all tasting about the same. People had their favorites of course and there is nothing like a cold Greek beer on a hot summer day. But the two or three major companies had a stranglehold on the country and it was almost impossible to get your foot in the door. The first micro-brew I can recall is Craft. They had a restaurant brewery on Alexandras Avenue which opened in about 1997 and was similar to what you would find in the USA. They made several nice beers which started out being available only in the restaurant but slowly began appearing on draft in any bar or restaurant that would carry them. They seem to have gone out of business, unfortunately. That is what you get for being a pioneer. Vergina from Macedonia makes a premium lager, an amber pilsner and a Weiss which I especially like. So much that I drank it pretty much every night after I convinced my local taverna in Kea to order it for me and gained so much weight I had to ask them not to order it anymore so I could go back to drinking wine. It worked and I lost 20 pounds but I still order it when I see it on the menu. I actually like it better than most of the the German Weiss beers and all of the American ones. The owner was written about in the NY Times because when he started his company all the big beer companies ganged up on him and tried to limit his visibility. (I am saying this in a nice way. You should read the article if you can find it). He was probably the first one to take up the large (foreign owned) breweries and opened the door to what follows. Septem is an award winning microbrewery with a large stable of seasonal and every-day beers with new beers being introduced every time I look at their website. Their brewery is on the island of Evia on the way to Kimi. They make a number of really good beers and from the beginning I predicted big things for them and always ask for their beers whenever I am in a cafe and in need of one. Last time I was in Athens I had their 8th Day IPA and Citra. Anyone who longs for California-style IPAs, like Lagunitas, should be able to survive their 2 week holiday in Greece by drinking these. Try their LAVA, an Imperial India Red Ale, one of my favorites, which the owner of a beer store gave me to try and I ended up bringing it back to America. Another favorite of mine is Kleos, an Oak Barrel Aged Imperial Stout which I also brought back to America to drink on a cold winter night. 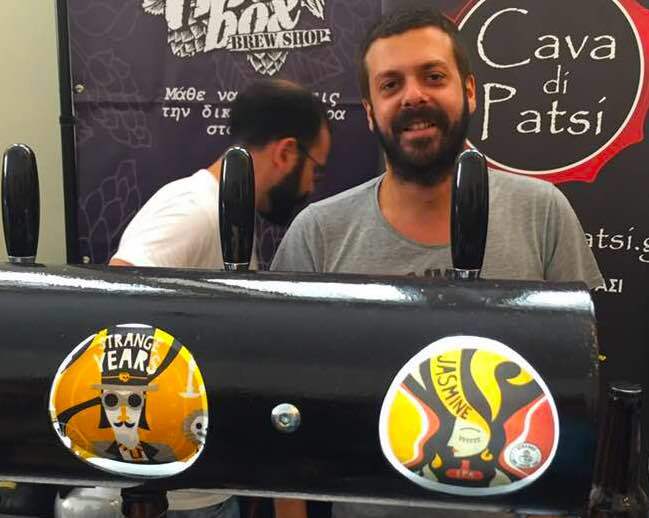 Donkey Santorini Brewing Company is owned by A Greek oenologist, a Serbian brewer, an English brewing enthusiast, and an American and they make Yellow Donkey, Red Donkey and their Crazy Donkey which lays claim to being the fist IPA in Greece. Volcan is also from Santorini and they make a Santorini Blonde and a Santorini Black. They use all local ingredients including the famous citron of Naxos, botanically classified as citrus medica– the oldest known variety of citrus. Nissos from the island of Tinos, owned by beer lover Alexandros Kouris, has a number of delicious beers, 100% natural and traditionally brewed, including the Nissos 7 Beaufort which is a very flavorful dark pilsner that I tried at the Athens Craft Beer Festival and loved. Another up and coming company is Siris, from the town of Serres which is known for Babatzim Ouzo and Tsipuro and they have a number of quality beers including a stout, IPA, and several others including their Happy Brewers line which feature a hoppy lager and an East Coast IPA. Voreia also makes a delicious Barrel-Aged Stout and several other quality beers including a pilsner, an IPA and a Weiss. Midnight Circus Gypsy Brewery began in an apartment in Exarchia in 2013 which makes them pioneers of the Greek micro-brew craze and are known for their One-Eyed Jack, pre-prohibition Lager & the Queen of Hearts, Red Ale. Sigri Brewery in Lesvos call themselves the first Lesbian beer company and feature the Nissiopi Blonde Ale and the Sedusa Red Ale. Be sure to ask for it when you go to Lesvos. My favorite beers may be the ones that come from Strange Brew, a gypsy company originally from Lakonia (Sparta, where my family came from, but relocated to the island of Chios. The company is owned by two young guys, Orestes and Giorgos. Their Jasmine IPA was the one of the first west coast IPAs that I thought rivaled anything I had tasted from the USA including the Pliny the Elder which was mailed to me by a fan several years ago. Their Strange Years is a New England IPA and they also do a Saison and a Barrel Aged Barley Wine and everything I have tasted from them has been good if not great. 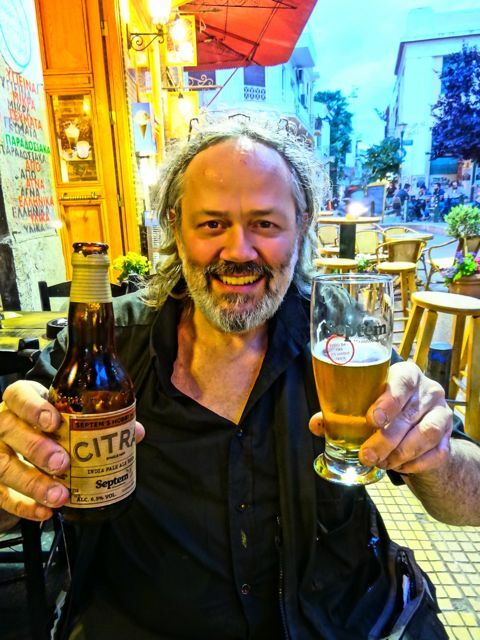 Flaros began in Sifnos, where I first discovered them, but they have also relocated to Chios and their beer includes a Pale Ale, IPA, Amber Ale and an American Wheat. Other beers worth trying are Solo from Heraklion, Crete who make an IPA, a White IPA, a Sour Kolsch and a couple of stouts Xarma, also from Crete feature a Dunkel, Bitter Weiss, Belgian Golden Ale and an Australian lager. Brinks beer is from Rethymnon, Crete and they make unfliltered organic beer, a blonde and a dark. Dark Crops from Elia in the Peloponnesos, make a Belgian Dark Ale, a couple American Pale Ales and an Imperial Stout. Their Bourbon Barrel Aged Stout may be the best barrel aged stout I have ever had and was one of several beers I brought back to the USA to share with my other beer-loving friends but ended up drinking all myself. Noctua which is becoming popular in Athens and the beers from Anastasiou Brewery in Halandri are a couple Athenian companies who make good beers. Peiraiki make a lager and a black beer and are based in the port of Pireaus. If you are in Zakynthos be sure to try the local Levante Craft Beer. Zeus Brewing Company are based in Argos, in the Argolis and were another one of the early micro-breweries to open and their patriotic bottles are very distinctive though not easy to find. Three cases magically appeared at the Hotel Attalos for me in 2008 and I wrote to the company repeatedly to thank them and to ask about coming to see the brewery and get some more because I really liked it. But I never heard back from them. They make a lager, pilsner and a black weiss. 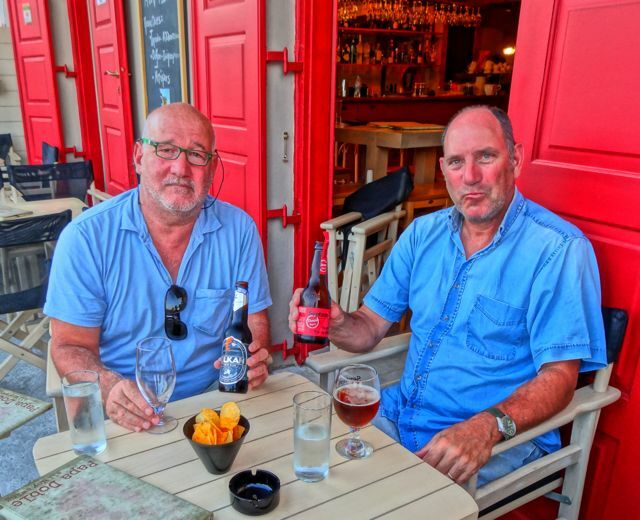 You can also find their unfiltered beer in many places in Nafplion and even in Athens, sold in plastic bottles with twist off tops. Both Alfa and FIX are labels that disappeared 20 years ago, after the Dutch and German companies who had entered the market in the sixties finally took over. But they have both returned for those who are nostalgic for the good old days. FIX was the first Greek beer, first appearing around 1850 when Yiannis Fix returned to the land of his ancestors to produce beer for the Bavarian officers who accompanied King Otho after the liberation of Greece from the Turks. The name FIX was synonymous with the word beer for decades until the company disappeared in the nineties and their factory on Syngrou, probably the biggest building in Athens, closed and stood empty for years. The name was licensed to a new company who brought back the old recipe with much success. It is a premium lager with an alcohol content of about 5% which means you can drink it pretty much all day long. Alfa is made by Heineiken as it has always been. Mamos, which can be found in many restaurants, is an old beer from Patras that they have brought back from the dead. It is made by a major brewery, I forget which one, and that enables them to be found easier than most if not all of the independent microbrews. Still finding anything besides Amstel, Heineken and Mythos may be a challenge especially once you get out of Athens. Most restaurants will only have those beers though cool bars will have two or three micro-brews if you ask and you can actually walk around and see signs and stickers advertising the more obscure beers at bars and cafes. There are a number of imported beers in Greece which you can find in bars, cafes and even in your local periptero (kiosks). I found Chimay in a periptero in Psyhico which I spotted when I passed it on the bus. I jumped off at the next stop and ran back and got some. My local bar in Kypseli, Allotino, in Agios Giorgos Square, carries obscure beers like Paulanner Strong Bock on draft and the distributor drives around in a beat up old Fiat with the kegs in the back seat. They also carry the Vergina Weiss on draft and he changes beers every so often to introduce people to new ones. But where can you go for a large choice of Greek microbrews and imported beers and maybe some food to go with it? In Psiri there is Beer Time which is right on the corner at Iroon Square, right at the hub of the nightime activity in the neighborhood. They have a large number of Greek microbrews and some Belgians and these individual beer kegs that sit on your table so you don't have to ask the waiter every time you finish your beer. You just pour it yourself. The new menu has every Greek beer and a description of each. My last visit I had an excellent draft IPA by Septem. It may have been seasonal but you should ask if they have it. The owner of the bar is Thanos who is a true beer lover and he supposedly imports many of the beers he carries himself. If you are feeling generous and want to make a friend bring a bottle of your favorite American micro-brew for him to try. Beer-makers who want to get their beer into Greece might try starting with him. You can e-mail him at info@beertime.gr. Also in Psiri is the Po Boy's BBQ who support the local craft beer industry with over 40 different microbrews from all over Greece. They are located at Agatharchou 12 & Lepeniotou which is off Navarcho Apostoli where it becomes Takis Street. 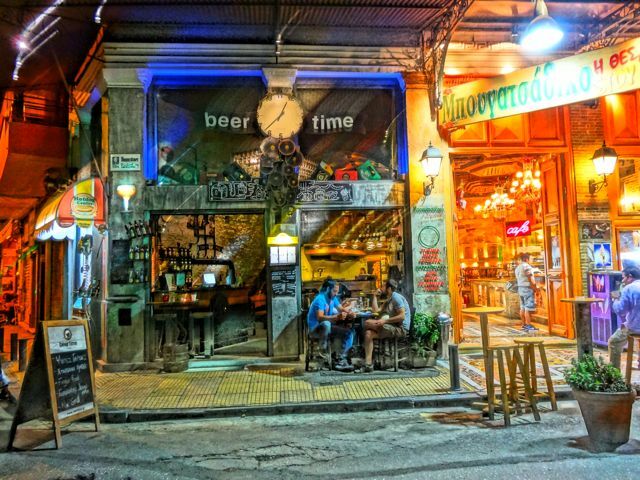 In the Plaka on Nikis Street there is another place that prides itself in selling all the Greek microbrews as well as some popular and obscure European beers, formerly called Athens Beer and now called Athina's Cook. 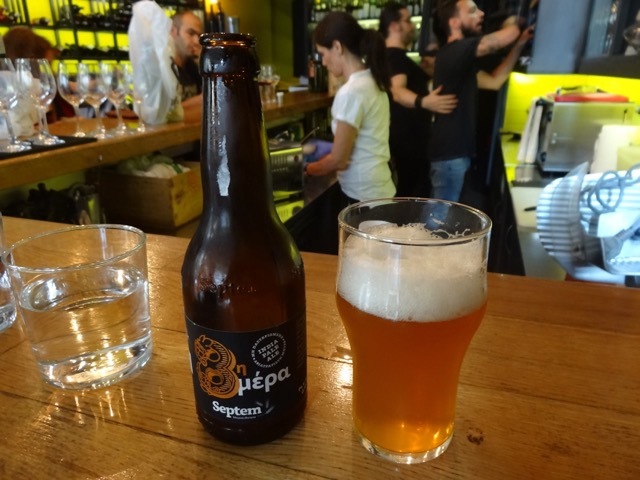 If you make it as far as Kypseli and want to check every cafe on both sides of Fokionos Negri you will find that most of them have one or two interesting beers that you may not have seen elsewhere in Athens. Or you can go right to Beer Tales at #52 Fokionos Negri where they have a large assortment of Greek, Belgian, European and international beers and has the best setting of any of these places, being basically in a park. They also have special music nights, for example Rory Gallagher Night, which does not mean that he played there but they played his music. Every beer place should have a Rory Gallagher night. Which of course brings me to the James Joyce Pub, an Irish pub owned by Irish people at #12 Astigos Street in Monastiraki, carries Guinness, Kilkenny, Fosters, Carlsberg, and Heineken on draft and Buckler, Bud, Stella Artois, Corona, Coor’s Lite, Pilsner Urquell, Warsteiner and Magners Cider in bottles. Vini Pub at 10 Drakou Street in Koukaki right by the old FIX building has 65-70 imported beers, mostly Belgian. 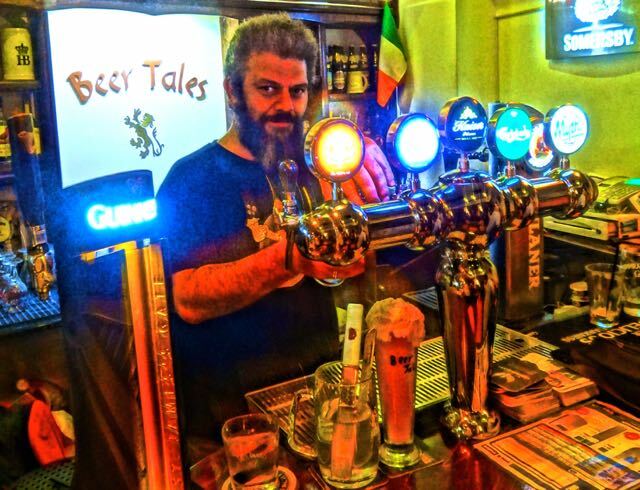 If you have a long wait for your ferry in Pireaus then make your way to O'Connell's Pub, another Irish flavored and Irish owned pub with a nice selection of beers (and a larger selection of whiskeys) and a large menu too. It is across from the cruise ship terminal at Akti Miaouli 79. Maybe the best place to try Greek Microbrews is at Barley Cargo, located at 6 Kolokotronis Street just up from Lekka Street, a few blocks from Syntagma Square. They have over 200 beers from all over the world and promote local craft beers with beer tastings and other events. They also serve food. The Local Pub at Chaimanta 25 in Halandri is considered by many to be the best beer hall in Athens. 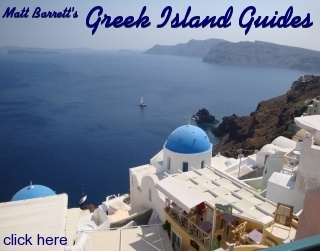 You can take the metro to Agia Paraskevis and walk or take a taxi from the metro station but you may as well just take a taxi from downtown if that is where you are staying. (It will cost about the same as 3 beers.) If you want to buy some interesting beers to take to your hotel room try Beer Corner at Perikleaous 12 just a block or two down from Syntagma Square. On Nikis Street #50 there is a brand new beer store called BREW STR where you can buy, drink or sample lots of Greek and foreign microbrews. The past couple years I have been importing my own beer to Greece. Not my own company actually but some beer I made with a friend of mine that I drink on special occasions. I also bring the best American IPAs I can find and if you want to make friends very quickly just bring a couple bottles with you when you visit one of these beer establishments so they can try it. It is very rare that they get to taste anything like Lagunitas and the other well known American microbrew companies, much less something from your own town. 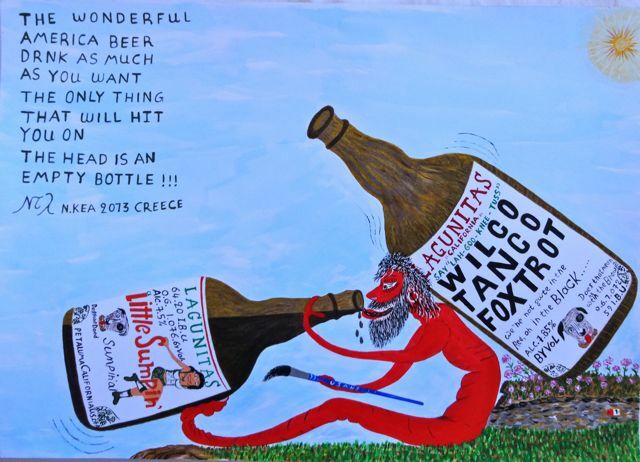 When I turned on my artist friend, Andonis Delapitsa, to a well known American IPA he had such an epiphany that he made a painting of the experience and the company liked it so much they wrote to thank me. So if you love beer enough to have read this whole article bring some with you to share. And if you think about it leave a bottle for me at the Hotel Attalos in case I run out. For decades beer in Greece meant run-of-the-mill lager beers and nothing else. Initially Fix was dominating the market, followed by Amstel and Heineken. 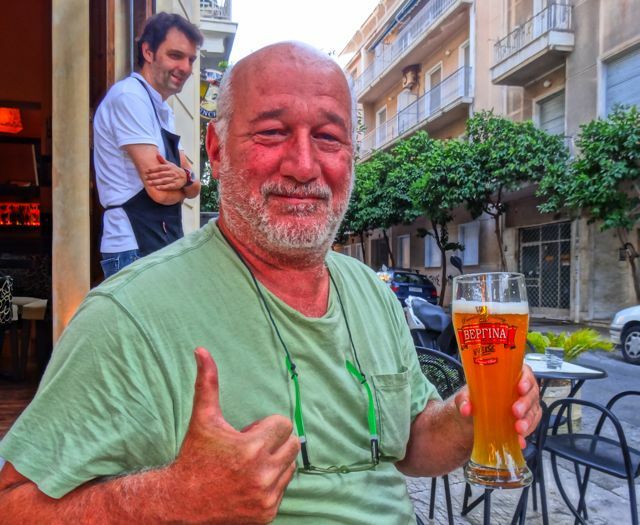 At some point, a new series of greek lager beers entered the market and slowly seeped through the locals' preference (mostly by aiming to their sentiment of patriotism market wise) in the names of Mythos and Alfa, followed by the revival of Fix. Today, none of these beers are Greek any more. Mythos and Fix are now a subsidiary of Carlsberg, while Alfa is a subsidiary of the Heineken group. Personally I find all of the above of exceedingly low quality, (especially since I've tasted actual quality beers), but they are cheap, easy to find everywhere and served always iced cold which helps mask their piss poor taste. 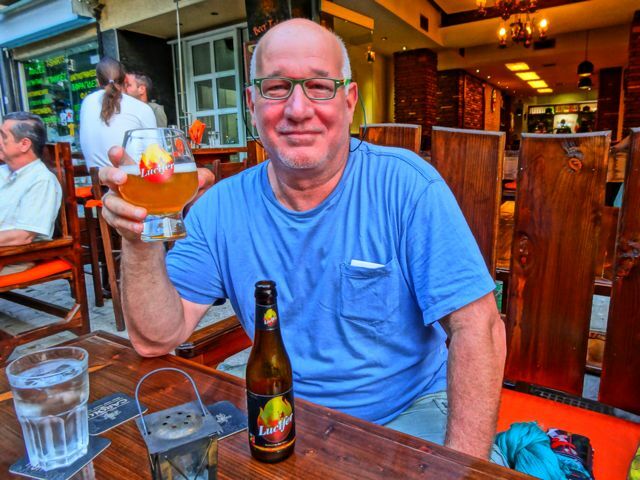 In the last decade the greek microbreweries have bloomed producing fantastic and high quality beers, some of which can rival famous international quality beers. Now, nobody can claim in any country what the "best" beer is, because the style of beer as the beer itself is a subjective matter of taste. But if you want to try actually Greek beers, here are a few suggestions (though you might have to search a bit to find them, most probably in beer restaurants or establishments that respect their customers' palate and they are a bit more expensive than the ones you find at street kiosks). For Radler/Shandy ones, just get any lager and add lemonade and/or Sprite.